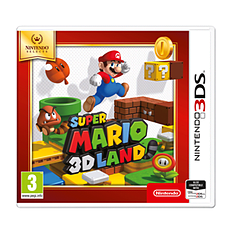 Experience a new Mario experience with a full 3D adventure where Mario must once again save Peach from Bowser. The Tanooki Tail makes a return to Mario’s repertoire of power ups that lets Mario over, Glide and attack! Meet old and new enemies like Goombas with Tails, stack Goombas and new Piranha plants! Play Mario in 3D for better depth and distance perception, without 3D-glasses.